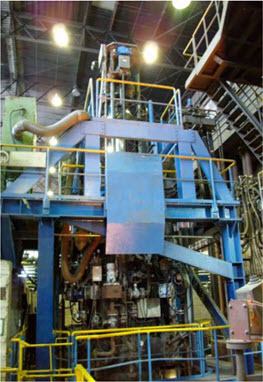 The pressure electroslag remelting process is a recent advancement and allows for the manufacture of new high nitrogen alloys with unique properties under pressures of several atmospheres. Much higher levels of nitrogen can be achieved due to the pressure applied above the slag which can be increased significantly above normal atmospheric pressure levels. The ESR is the metallurgic process for the production of steel with high purity and a controlled solidified and respectively faultless structure. It is well known as a refining method used mainly in the steel and superalloy industry. The main goal of this process is the inclusion, removal, desulphurization and the adjustment of a uniform microstructure. The fundamentals of this process are described elsewhere and are not further outlined in this paper. Many alloys contain elements like aluminum and titanium which, when heated, react with oxygen to form oxides. Oxides are detrimental to premium quality melted alloys. Premium grade alloys, such as those required by the aerospace, energy, medical and automotive industries, can be protected from the atmosphere and residuals by melting inside a vacuum container. This approach gives the metals producer more control over alloy chemistry. The result is a cleaner, more uniform product with the superior properties required for critical service applications. On the other hand, the investments in state-of-the-art technology such as Pressure Electro Slag Remelting (PESR), Vacuum Induction Melting (VIM) and Vacuum Arc Remelting (VAR) are the result of research showing a real need for a new generation of steels. 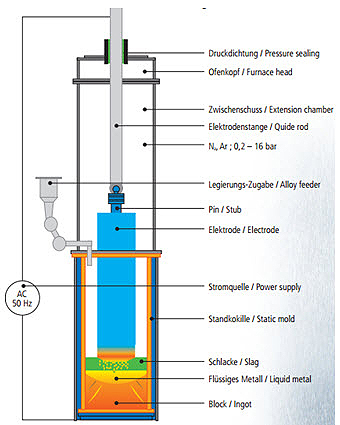 Electroslag Remelting (ESR) is a secondary refining process used to further refine many alloys. As a feedstock it uses consumable electrodes produced either by VIM or conventional air melting. Conventional ESR improves the microstructure and cleanliness of the VIM, or arc melted alloy, by removing inclusions as the metal passes through the slag and controlling the solidification rate in the refined metal ingot to minimize chemical segregation. Melting through the slag permits very close compositional control. A more recent advancement is Pressurized ESR (P-ESR) furnaces, which have the ability to melt alloys under nitrogen pressures of several atmospheres and produce very high nitrogen steel compositions that cannot be achieved via standard air melting techniques. This capability allows the manufacture of new and novel high-nitrogen alloys with unique mechanical properties. Pressure ESR (P-ESR) is an even more advanced process than standard ESR. With pressure ESR the metal is melted under elevated nitrogen pressure, permitting the production of alloys with high levels of nitrogen. For P-ESR, the standard ESR crucible is enclosed and becomes a pressure vessel melt chamber. With this design, the pressure above the slag can be increased to levels that are significantly above normal atmospheric pressure levels, enabling much higher levels of nitrogen to be achieved. The P-ESR furnace can also melt at atmospheric pressure, in an air atmosphere or with an inert gas cover of argon over the slag. Having an inert gas cover over the slag enables enhanced compositional control of reactive elements, such as aluminum and titanium, during melting. The high-nitrogen compositions from the P-ESR process cannot be achieved through either conventional ESR or VAR melting techniques. Today’s biggest PESR unit is located at Energietechnik Essen GmbH, Germany. Its operating pressure is max. 40 bars and can achieve ingot weights up to 20 tons and 1030 mm diameter. The functional principle is shown schematically in Figure 2. Basically, the PESR process is a conventional remelting facility that works in a pressure tank. The process is designed to meet both, an ESR refining and nitrogen pick up. The metallurgical approach is similar to a standard ESR-process, i.e. refining, low segregation, no porosity or shrinkage, defined microstructure and solidification.